Union County Special District filing deadline is March 17! Union County citizens should note that the filing deadline for all Special District elections in our county is Thursday, March 17th before 5 pm! We encourage all Democrats to help their communities by filing to serve on the boards of school, fire, parks & recreation, health, cemetary, or sanitation districts that will be on the ballot in May. Section 3. To call on the State Executive Committee to forward the resolution to the Wisconsin Democratic Party in order express our solidarity in their struggle and our admiration for their efforts. Union County Democrats, please review this text before the next meeting. Our current economic crisis has many causes: launching two wars on borrowed money, passing huge tax cuts for corporations and wealthy Americans, expanding prescription drug benefits (Medicare Part D) without paying for them, and a financial collapse due to Wall Street's unrestrained gambling. The Bush administration and its Republican (and Blue Dog Democrat) enablers in Congress set this stage. In a mere eight years, they turned the Clinton-era budget surplus into a trillion+ dollar deficit. However, their own culpability in this havoc has not hindered Republicans from laying the blame on President Obama and Democrats. Republicans now act as if the economic crisis and the growth of the deficit simply popped into existence on January 20, 2009. This sudden concern about deficits, stirred together with revenue shortfalls from our weakened economy, creates a crisis atmosphere. The "crisis" gives Republicans at the federal and state level convenient cover to attempt draconian cuts to programs they dislike: Planned Parenthood, the WIC nutrition program, the EPA, public broadcasting, unemployment insurance, Medicaid, Medicare... the list in endless. The cuts are proposed in the name of "sharing the sacrifice" and "fiscal responsibility." But the sacrifice is not shared and the cuts are not responsible. A recent Letter to the Editor in The Observer betrayed a fundamental misconception about climate change. The writer claimed that since there were heavy snow storms occuring in the US it must mean that global warming is a bunch of baloney. She painted an amusing picture: Al Gore, Nobel Peace prize winner for raising global warming awareness, is stuck in a snowstorm, denying the reality of the blizzard all around him. The misconception is that our local weather today is an indicator of global weather long term. It is not. Weather is a complex, dynamic system. Distant, unseen climate forces can have widespread and persistent consequences. Because of this misconception the letter writer simply brushes aside decades of scientific research as "baloney". As a result, she is denying the reality of climate change around her. The picture that the scientific evidence paints is not so amusing. Greenhouse gasses are at the highest levels in history. These gasses cause steadily rising air and ocean temperatures. Human activity, particularly burning fossil fuels, is mostly to blame. If this decades-long trend continues unchecked, the environmental impact will be widespread and devastating. The evidence is overwhelming and no reputable climate researchers dispute it. The Intergovernmental Panel on Climate Change (IPCC), NASA, and the NOAA - to name but a few organizations - have mountains of peer-reviewed research documenting the facts of climate change. Even the Pentagon and the CIA now consider global warming a grave national security threat. Hello! My name is Glen Scheele and I am honored to serve as the new Chair of the Union County Democrats. My wife and I have lived and worked in Oregon for more than 30 years, mostly right here in the Grande Ronde Valley. We feel privileged to have raised our three children in this wonderful community. I’ve always been a Democrat and active in politics. But in recent years I decided to take an even more active role in light of the grave challenges we face. Our nation has been at war for a decade. We are in the midst of the worst economic crisis since the Great Depression. Millions of our fellow citizens are unemployed. Millions have lost their homes. Reckless gambling by Wall Street and banks has decimated the modest savings of our working families. Decades of relentless, well-financed conservative attacks have eroded faith in a common purpose. As a result, Republican themes – Privatize! Deregulate! Shrink Government! Cut Taxes! -- have gained traction. Yet these policies are failures. For proof we only need to look at how much more precarious life has become for ourselves and for millions of our fellow citizens after decades of pursuing these policies. There is a saying: “In crisis is opportunity.” Unfortunately for some it’s an opportunity to enrich themselves or cynically grab for political power. Corporations are earning unprecedented profits, yet continue to ship jobs and investments overseas. Wall Street and Big Banks are earning unprecedented profits, yet refuse to ease access to credit or help struggling home owners. Republicans have decided that to win the next election they must make Democrats fail, no matter the cost to average Americans. I believe Democrats see different opportunities. Tough times mean a chance to leverage smart public spending to rebuild, to modernize, and to jump-start our economy. A reckless financial economy can be reined in once again serve the real economy. Corporate excesses can be addressed with sensible regulations that benefit workers, consumers, and our environment. The many families being saved from impoverishment by Social Security, Medicare, and the new health care reform will make the case to further strengthen those programs. At times, I’ve been overwhelmed by the challenges and felt powerless to address them. I found that by teaming up with my fellow Democrats I no longer felt powerless or overwhelmed. Democrats are ready to stand up, to speak out, to work, and to fight for what is right. As Dr. Martin Luther King Jr. said, “The arc of the moral universe is long, but it bends towards justice.” Won’t you please join us to hasten that day? 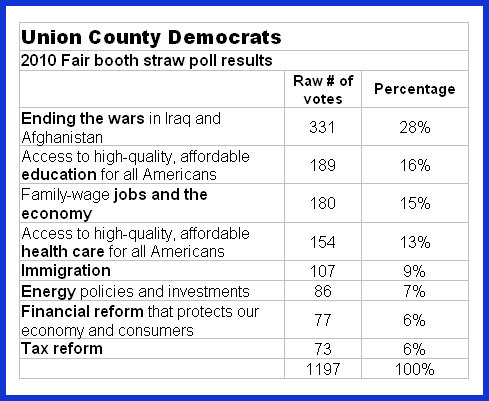 Contact the Union County Democrats. Let us know what you materials you need to show your support. The Democratic Party of Oregon has released the 2010 platform.